It seems like a win-win situation on the surface: You contribute to a 401(k) plan, investing in your retirement, and the Internal Revenue Service lets you do it tax-free...at least until you begin to withdraw the money and its earnings. You invest with pre-tax dollars, and this reduces your taxable income so you pay taxes on less earnings in the years you make contributions. But the IRS isn't known for its unlimited generosity. You can only contribute tax-free to a 401(k) up to certain limits per year. The limits set by the IRS each year for maximum contributions to 401(k) plans are adjusted annually for inflation. You could contribute up to $18,500 in 2018 as an elective salary deferral to a 401(k) plan, and this increases to $19,000 in 2019. You can make an additional "catch-up" contribution of $6,000 each year if you're age 50 or older. The catch-up contribution is not adjusted for inflation. The limit applies collectively to all 401(k) accounts you might have in the current year. 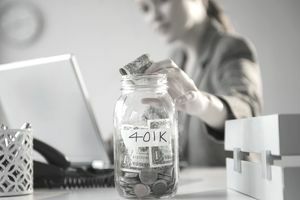 You might have to track your 401(k) contributions to make sure they don't exceed the maximum allowed if you work at two or more jobs or if you switch jobs in the middle of the year. It's probably easiest to break the annual limit down into equal installments per pay period if you can contribute the maximum. You'll be saving the same amount each pay period and will be dollar-cost-averaging into your retirement investments. Matching contributions from your employer are limited to 25 percent of your salary. The matching contribution is limited to 20 percent of your net self-employment income if you're self-employed and funding your own 401(k). Matched funds are always contributed to the tax-deferred portion of the 401(k) plan. The total of elective salary deferrals plus employer matching contributions is limited to $56,000 in 2019, up from $55,000 in 2018. Elective salary deferrals can be placed into either a tax-deferred traditional 401(k) or into an after-tax Roth 401(k) account. You can even make a combination of contributions to both traditional and Roth accounts, as long as the total of all salary deferrals are equal to or less than the annual maximum. You might also be able to make additional "after tax" contributions—from your remaining income after withholding—after you reach the limit, but this isn't allowed by all plans. And total contributions from all sources, including your employer, must be less than the $56,000 limit. This increases to $62,000 if you're age 50 or older. Employers can limit the contributions of Highly Compensated Employees (HCEs). The minimum compensation threshold identifying these employees increases from $120,000 in 2018 to $125,000 in 2019. The ceiling on earnings calculating employer matching contributions and employee deferrals rises from $275,000 to $280,000 in 2019. Plans utilizing a safe harbor design are an exception to this rule. ​You can make deferred contributions from your last paycheck of the year, but your deadline is otherwise Dec. 31 for 401(k) contributions for tax years 2018 and 2019. The IRS announced these changes somewhat later than usual in 2018, and your employer might be scrambling to catch up. Check with your human resources department if you have questions regarding the benefit materials you received, such as that they don't line up with these numbers. How Much Can You Save in a 403(b) Retirement Plan?